It is the end of the month and that means it is The Daring Bakers Challenge deadline. This month’s Challenge was hosted by Rosa’s Yummy Yums. Our challenge is something that we love in our house and that is homemade pizza. When people think of baking, typically something sweet, creamy, and chocolatey come to mind, at least that is what comes to my mind. I am so glad that this month our challenge involved something I could serve my family for dinner. This month’s recipe is Pizza Napoletana from Peter Reinhart’s The Bread Baker’s Apprentice. Included in part of the challenge was capturing yourself tossing the dough. I, unfortunately, do not have a picture of this, so please check out the Daring Bakers blogroll for wonderful pictures of my fellow bakers who have mastered the toss. We also had to use both a sauce and toppings, but it was left up to our imagination as to what those included. I know a couple secrets to great pizza is a HOT, HOT, HOT oven and don’t overload the toppings. This is a recipe I want to try when I am at my in-laws’ place because they cook their pizzas on the grill. My father-in-law has a BGE (Big Green Egg) and it makes for some amazing pizza. My mouth is watering just thinking about it. However, this dough cannot be whipped up on a whim. You need to plan for it because it takes needs to rest in the fridge OVERNIGHT. 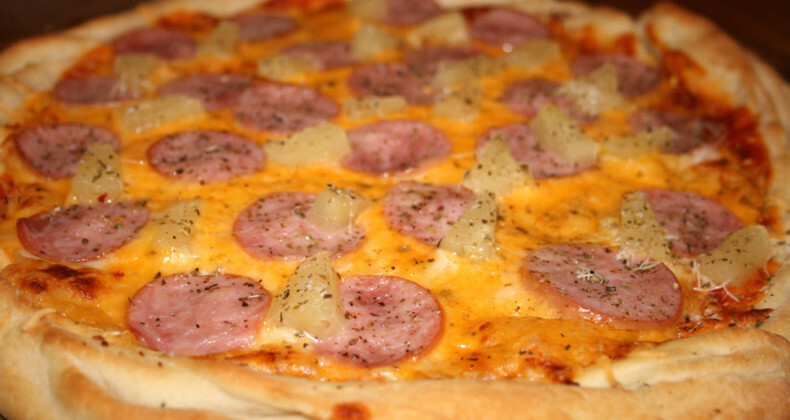 My pizza toppings include marinara sauce (very little), cheddar cheese, Canadian bacon (ham), pineapple (that has been blotted dry), dried Italian herbs, and fresh shredded Parmesan cheese. I do want to make a pizza with apples. I have a whole crisper drawer full in my fridge. Original recipe is taken from The Bread Baker’s Apprentice by Peter Reinhart. You can store the dough balls in a zippered freezer bag if you want to save some of the dough for any future baking. In that case, pour some oil(a few tablespoons only) in a medium bowl and dip each dough ball into the oil, so that it is completely covered in oil. Then put each ball into a separate bag. Store the bags in the freezer for no longer than 3 months. The day before you plan to make pizza, remember to transfer the dough balls from the freezer to the refrigerator. Remember that the best pizzas are topped not too generously. No more than 3 or 4 toppings (including sauce and cheese) are sufficient. Add the oil and cold water and mix well (with the help of a large wooden spoon or with the paddle attachment, on low speed) in order to form a sticky ball of dough. On a clean surface, knead for about 5-7 minutes, until the dough is smooth and the ingredients are homogeneously distributed. If it is too wet, add a little flour (not too much, though) and if it is too dry add 1 or 2 teaspoons extra water. With the help of a metal or plastic dough scraper, cut the dough into 6 equal pieces (or larger if you want to make larger pizzas). Put the pan in the refrigerator and let the dough rest overnight or for up to thee days. At least 45 minutes before making the pizza, place a baking stone on the lower third of the oven. Preheat the oven as hot as possible (500° F/260° C). Generously sprinkle the back of a jelly pan with semolina/durum flour or cornmeal. Flour your hands (palms, backs and knuckles). Take 1 piece of dough by lifting it with a pastry scraper. Lay the dough across your fists in a very delicate way and carefully stretch it by bouncing it in a circular motion on your hands, and by giving it a little stretch with each bounce. Once the dough has expanded outward, move to a full toss. When the dough has the shape you want (about 9-12 inches/23-30 cm in diameter â for a 6 ounces/180g piece of dough), place it on the back of the jelly pan, making sure there is enough semolina/durum flour or cornmeal to allow it to slide and not stick to the pan. Slide the garnished pizza onto the stone in the oven or bake directly on the jelly pan. Close the door and bake for about 5-8 minutes. After 2 minutes baking, take a peek. For an even baking, rotate 180Â°. If the top gets done before the bottom, you will need to move the stone or jelly pane to a lower shelf before the next round. On the contrary, if the bottom crisps before the cheese caramelize, then you will need to raise the stone or jelly.